You have the Same monitor as I do. Very easy to disassemble but you would need to becareful not to touch any of the capacitors or diodes as they do store 60,000 volts and can kill you. After I got the monitor apart I took a can of compressed air and gave it a good cleaning and installed a Cathode switch on the front. I've got 7 cathodes in my case so I"m sure taking two of them for my monitor would'nt hurt. My Monitor is going to take awhile as I've decided to go with a Jeff Gordon theme and paint on flames. Afterwards I'm going to have to sit patiently with a brush and detail the flames. Ackkk. Oh and VIP Discount Auto also has color changing paints in stock. I believe its around $15 USD a kit. These paints give that chromillusion color changing effect as you view it from several different angles. That holographic paint is sweet stuff. My dad takes old grayhound busses and restores them into motor homes. Really nice onces too. Were talking $300,000 rigs. We did one with some of that paint. Silver background with a couple stripes of that stuff. A 5-color blue / purple paint, and a 3 color red/orange/yellow. That stuff is SOO NICE. But its expensive. Like $500 a QUART i think. I have 2 HP 840Cs, I might take the defective one appart and see if i can pain it blue also. 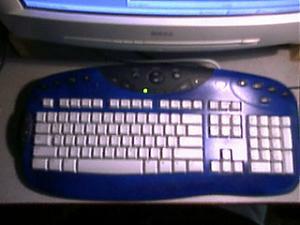 I jsut did my logitech keyboard blue its top is drying right now downstairs. I have the same mouse and keyboard as spyder, cept mine is the USB version not the wireles, I don't lke wireles right now..it dosent have the scrool wheel, thati use for volume because it responds better. I think you started real trend, should send this thread to logitech. I'm painting mine either a red or green flake today. Also the face of my case the same color. I have a Directron 201B black case with the silver knobs and buttons. Should look pretty sweet. I'll get some pics whan I get it done. You can see a teeny bit of green where the plexi bezel shows the sides of the CD drives. Not too shabby for a rush job. Dried it all with heat lamps too. Took about 4 hours to dry and 45 mins to do it all. It looks kinda 'gloppy' becuase the lighting can't pick up on the texture too well. Its a hand hammered finish. It's actually a pretty thin layer of paint on there. Maybe a clear coat will add some flavor. 99% of all computer problems are sitting in front of the monitor But.... so is the Solution! waaaa...hhh. My keys are part of the top of my kb. crud. So much for moddin the mskb. But yours are looking nice guys ! Please, in the future, if there is to be a viewsonic monitor pictured in a thread, a warning in the title would be nice.